Goal of the project was the devel­op­ment of wear resist­ant poly­mer compos­ites for the poten­tial replace­ment of heavy mech­an­ical struc­tural parts by light­weight compos­ite mater­i­als incor­por­at­ing wear resist­ant surfaces. 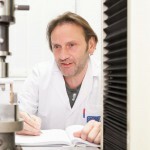 Therefor a rein­force­ment of the surface with depos­ited wear resist­ant coat­ing has been chosen. Within the LB-Verschleiß project AAC was respons­ible for the simu­la­tion of the struc­tural applic­a­tion of the indi­vidual indus­trial part­ners to derive the mech­an­ical require­ments for wear resist­ant coat­ings and inter­lay­ers. In addi­tion AAC is devel­op­ing concepts for bond­ing inter­lay­ers for improved mech­an­ical bond­ing strength of the wear resist­ant coat­ings able to with­stand the mech­an­ical load during oper­a­tion.